Note: the Founders Fund is not included in the table, as it was not launched until 2012. 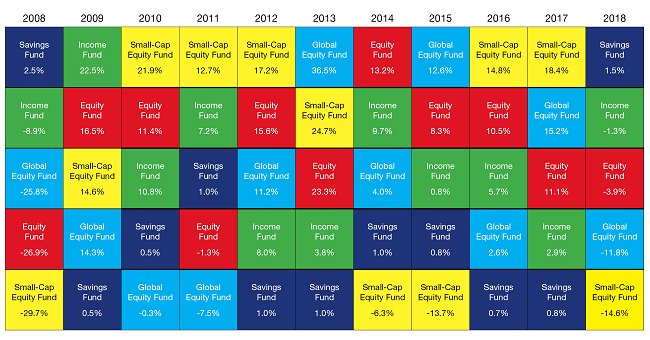 The fund's calendar year returns are as follows - 2013: 15.7%, 2014: 7.1%, 2015: 3.9%, 2016: 6.7%, 2017: 7.9%, 2018: -4.9%. Management fees and expenses all may be associated with mutual fund investments. Please read the prospectus before investing. Mutual funds are not guaranteed, their values change frequently and past performance may not be repeated. The indicated rates of return are the historical annual total returns including changes in unit value and reinvestment of all distributions and do not take into account sales, redemption, distribution or optional charges or income taxes payable by any securityholder that would have reduced returns.